Description: Plants with olive or yellow-brown laminate or ribbon-like fronds to 300 mm long; margins slightly wavy. Narrows to a short stalk and attached by a small disc. Habitat: Generally growing on stones and shells in shallow pools in sheltered places, particularly in harbours; found mainly in sping and early summer. 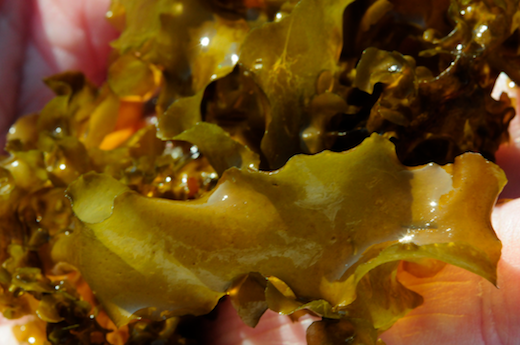 Distinguishing features: Thin, relatively delicate, fronds not mucilaginous and the absence of claw-like holdfast serve to distinguish this species from young kelps. Common names: Sea Petals, Broad Leaf Weed. Site © M.D. Guiry 2000 - 2019. Important copyright notice: all text, design and photographs on this site are copyrighted by M.D. Guiry unless otherwise stated and all rights are strictly reserved. Click here for copyright information and contact. Website design: 249 Design Studio. Site maintained by M.D. Guiry (michael.guiry@nuigalway.ie). There have been 8736662 page loads since 1 January 2014 on 25 April 2019.